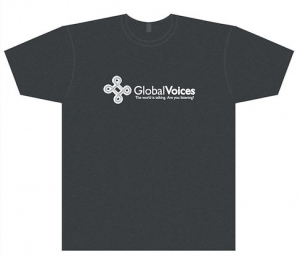 If you love Global Voices, there's no easier way to show it than to wear a beautiful new shirt. Are you having a meeting with Barack Obama  or the Queen of Jordan? Wear the t-shirt! Appearing on television? Don't forget your shirt! We've chosen a supplier that offers good international shipping prices and quality printing. We're not making any money on these sales, so there's no pressure to buy them. 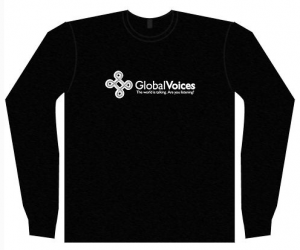 Of course, if you would like to make a donation to support the work we do at Global Voices , we'll happily accept. 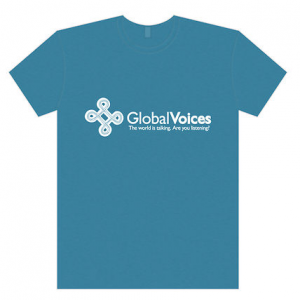 Global Voices is a community of bloggers  and translators , who work mostly on a volunteer basis to report on citizen media conversations around the world. We rely on your support to get by. Shirts are available in a variety of different shapes, sizes, and five colors. Every blogger in the world should have one.